Genesis Langrisser 2 (JPN) "all levels" in 1:56:46.59 by ars4326. 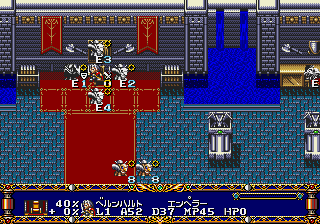 Langrisser 2 (ラングリッサー2) is the acclaimed sequel to Warsong, never finding its way to an official release in English. Who is this young woman? Why is a major military power intent on capturing her? And what's this have to do with a legendary holy blade? In ars4326's run, cunning strategy combines with heavy luck manipulation to produce a speedrun that completes all of the game's accessible stages (27 normal and 3 'hidden') in just under 2 hours. Virtually no level-grinding is found in this action-packed playthrough as Elwin & Co. seek to stop an Emperor's plans of uniting the continent with the power of an ancient demon sword! The movie file and the primary downloadable (HQ) encode have the author's commentary as subtitles.